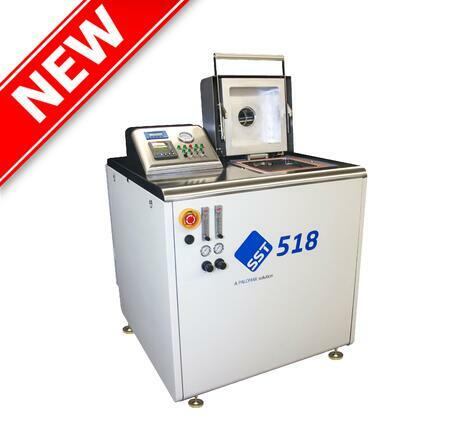 SST Vacuum Reflow Systems recently exhibited its systems and services at SEMICON China in Shanghai.At the show, we introduced a new product, Model 518, a mid-range, radiant heat single chamber system to create void free, flux free microelectronics packages. We had a lot of fun with a customer quiz/drawing, and we gave Bose Headphones away to some lucky winners! SST is proud be represented by Be First Technologies, in whose booth we displayed Model 5100 alongside the Model 518 and our parent Palomar Technologies’ 3880 die bonder. Be First’s booth was constantly full of customers, keeping all their reps and service personnel occupied. SEMICON was busy all three days! The halls were full right from the start, and there were customers and attendees walking, talking and learning even beyond the 5 pm closing time – something I’ve never seen before! This show has gained in attendance and importance over the years, and is truly an international event. As well as 5 full exhibit halls, tents were added to the area to contain all those who wanted to display their products and services. The business mood was optimistic in general, as US and EU markets seem to be recovering, and China remains stable as it diversifies its electronics capabilities. As always, the goal is for “faster, cheaper, smaller, better” products and devices – goals which are not always in harmony, but driven by markets, those of us who make the systems that create packages work hard to understand and deliver what our customers need. Outside, the first day of SEMICON was cold and rainy as is often the case in March, but the second and third days were quite sunny, making the wait for taxis not so bad. The good weather brought out lots of people, and it was great to catch up with old friends and associates. As always, Shanghai was a sparkling mix of its old dynastic history, 19th century western influence and the vibrant exciting buildings that have been created recently. So we left Shanghai and SEMICON China behind, having made new relationships, renewing old ones and with an air of excitement and expectation for the opportunities ahead in 2017.